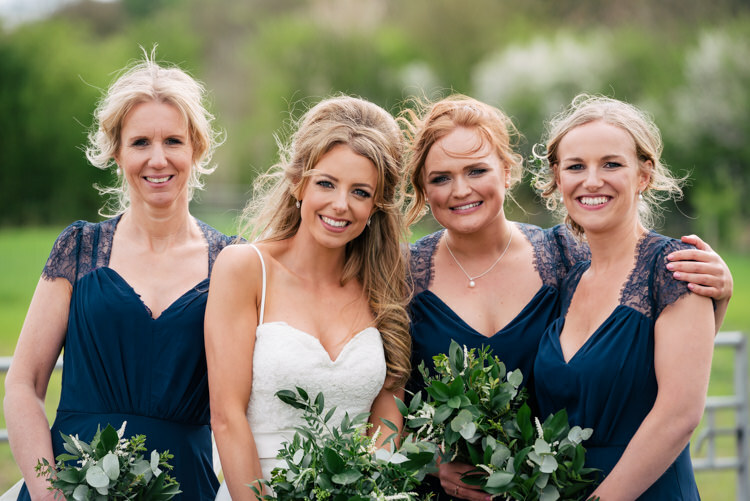 What a treat to share a wedding so relaxed, fun and full of joy with you today. 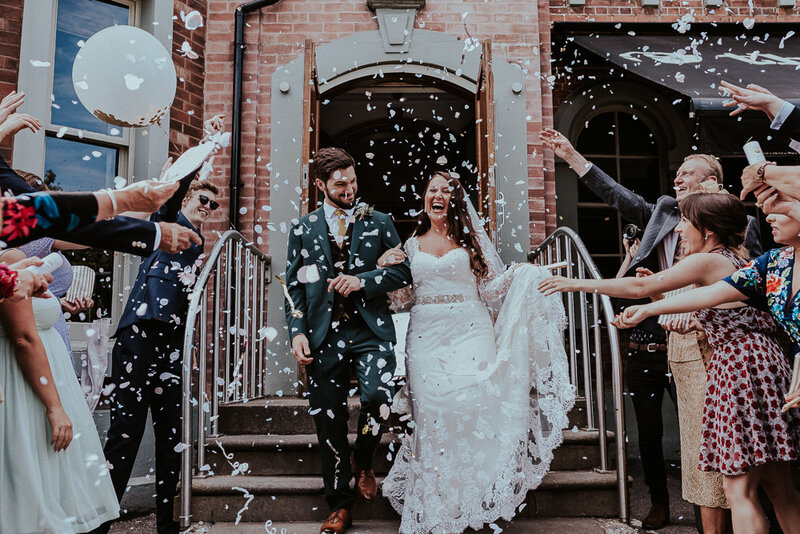 Haley and Rob tied the knot at The Faversham in Leeds; a city that they have lots of wonderful memories together in. 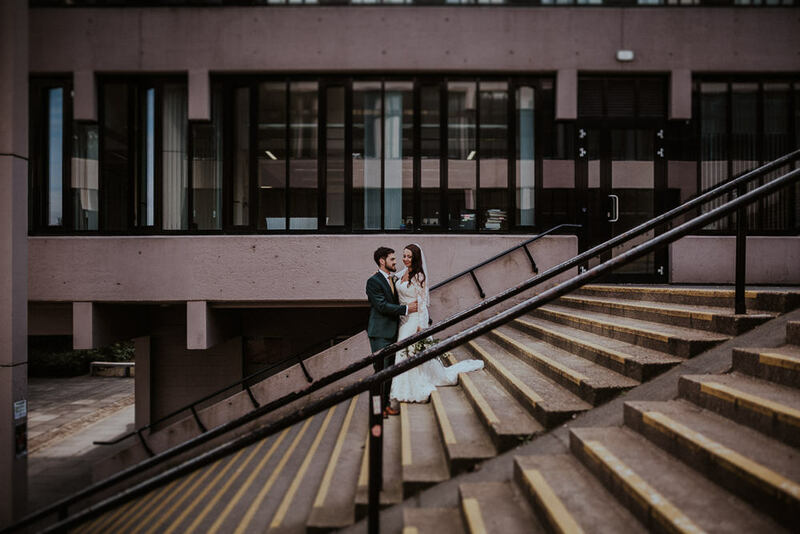 Having originally dismissed the venue as it was somewhere they used to go clubbing in their student years, they realised that actually it was the perfect place for their nuptials (having changed rather a lot in the time since!). 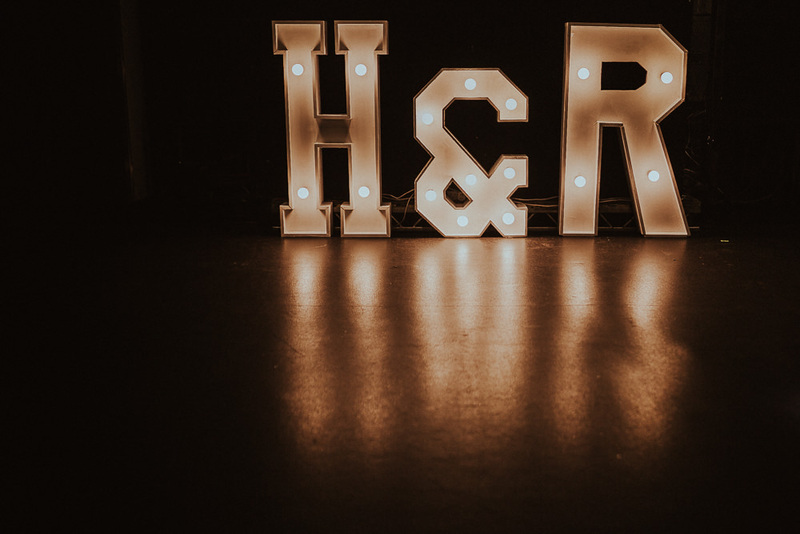 Rob and Haley really wanted their wedding day to be fun for them and their guests, with a long party in the evening to really let their hair down. 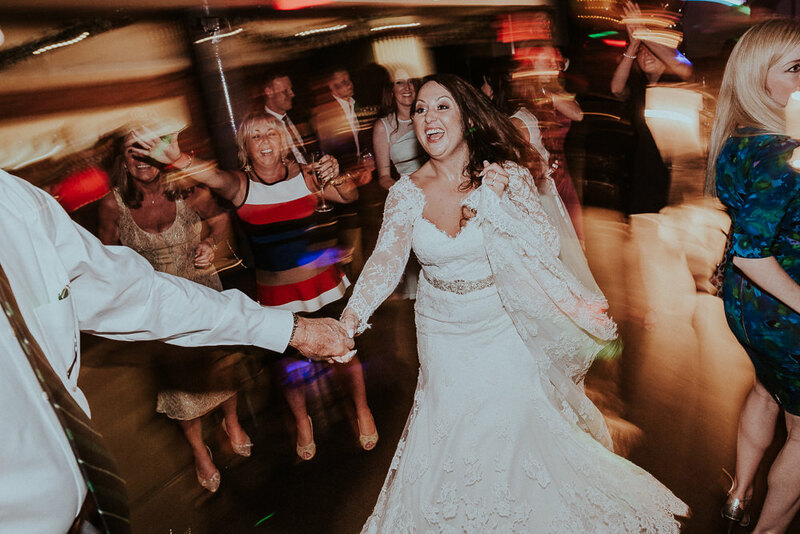 Their brass band sound fantastic and really got everyone dancing – it looks like everyone had an absolute riot! 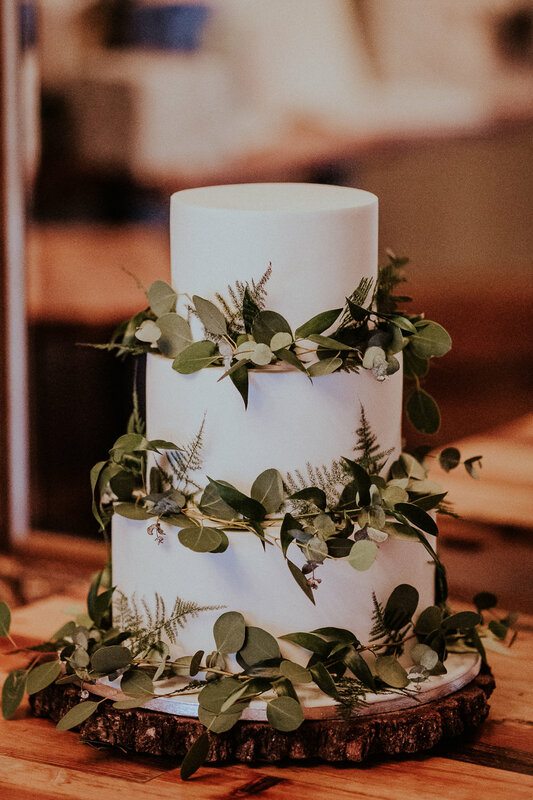 The flowers are simply beautiful and the foliage theme throughout the day is so effective, from the garlands adorning the roof of the conservatory to the cake decoration, I can’t get enough of all the greenery. 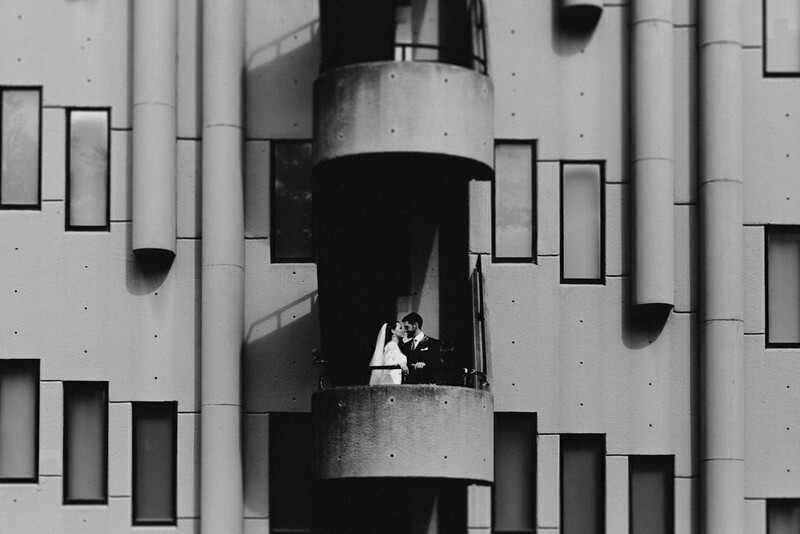 Of course we must also mention how brilliant Steven Haddock’s images are. 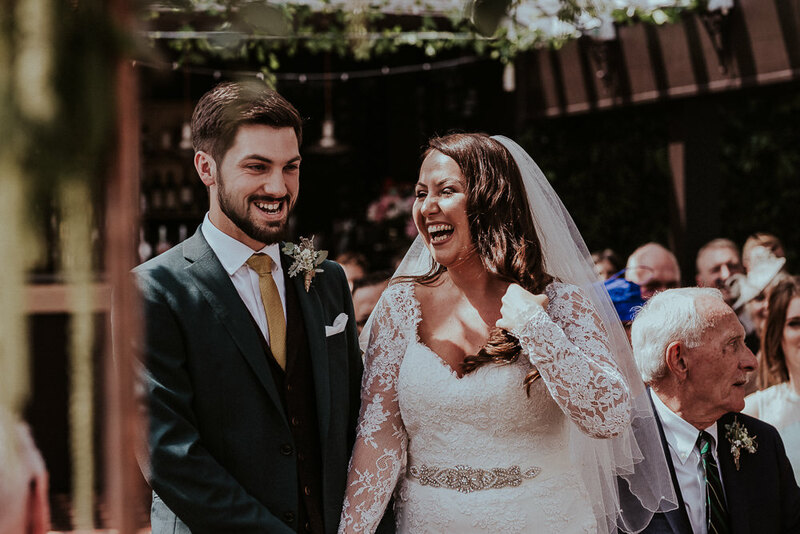 I love the way he’s captured the city feel of the wedding and the happiness radiating from the bride and groom. Thank you ever so much for sharing these with us today Steven. 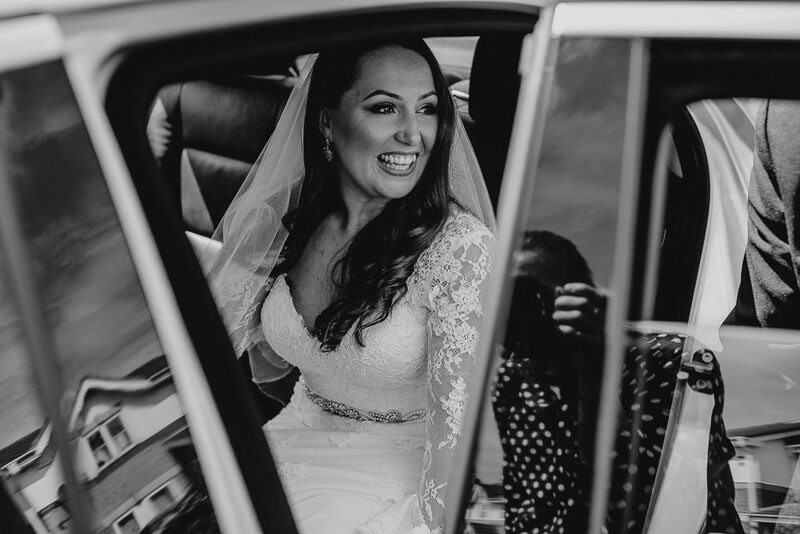 In June 2017, Rob and I (Haley – the Bride) travelled to Italy for our best friend’s wedding, and spent a week celebrating with a group of our friends on a beautiful Italian Estate in Tuscany. I’ve always wanted to visit Florence, so we booked to travel on to the city for a few days at the end of the trip, just the two of us. On our second night there, on our way to dinner, Rob stopped me in the middle of the Ponte Vecchio bridge to ‘get his camera out of his bag’… when I turned around, he was down on one knee holding the ring box with a beautiful opal solitaire in it (exactly what I wanted) and told me he wanted to spend the rest of his life with me. 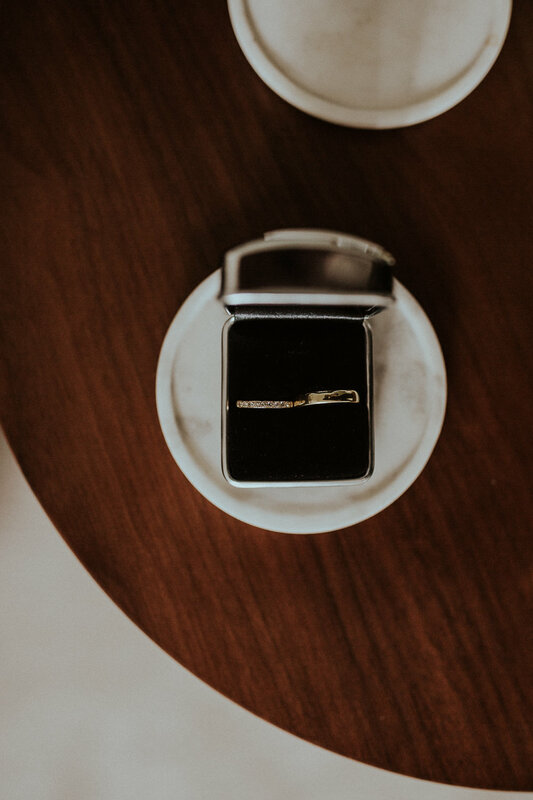 The fact he proposed in such a public, overtly-romantic place was the perfect surprise, as I never thought in a million years he’d propose in that way! 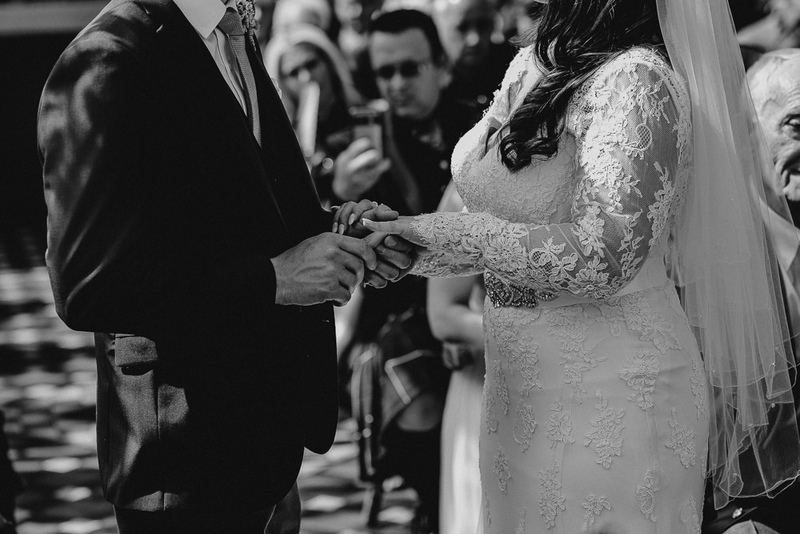 I’ve never considered myself a romantic, but I cried my eyes out – it was the best moment of my life. 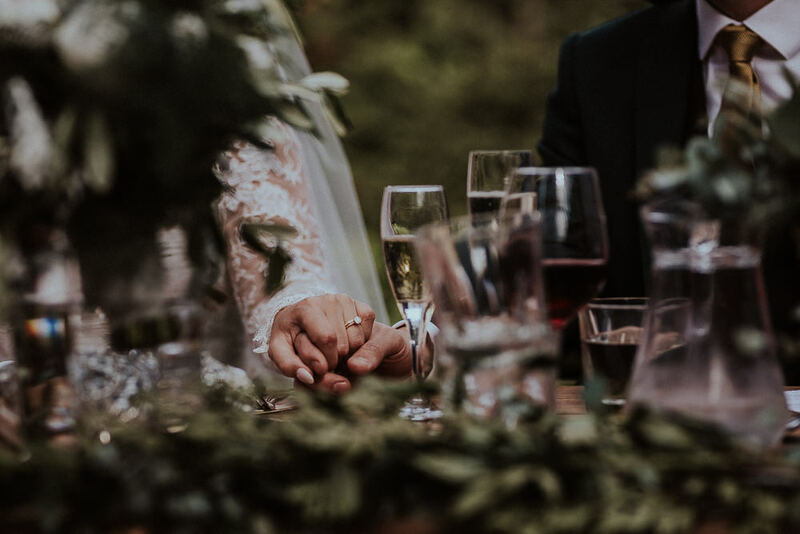 We both knew a few things right away; we didn’t want a long engagement (we’d been together for 9 years by the time we got engaged! 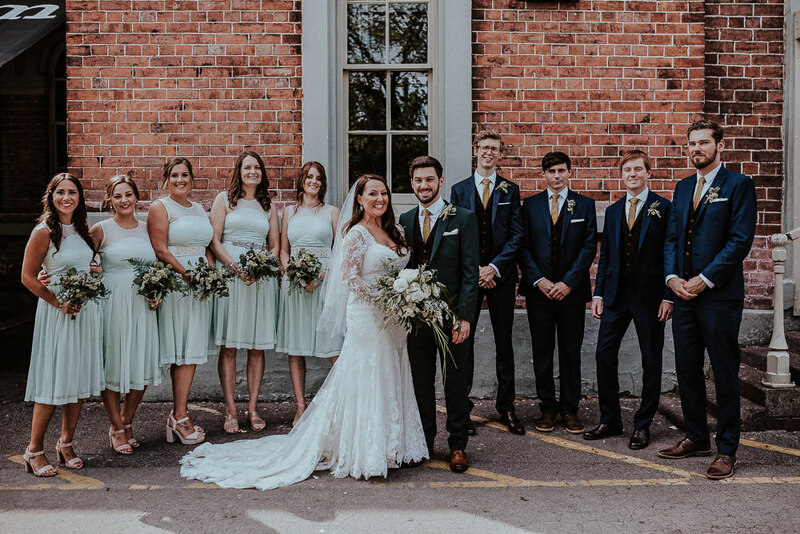 ), we didn’t want a traditional church wedding, and we wanted to get married in Yorkshire (we met and live in Leeds, and all our friends and family are in or near Yorkshire). 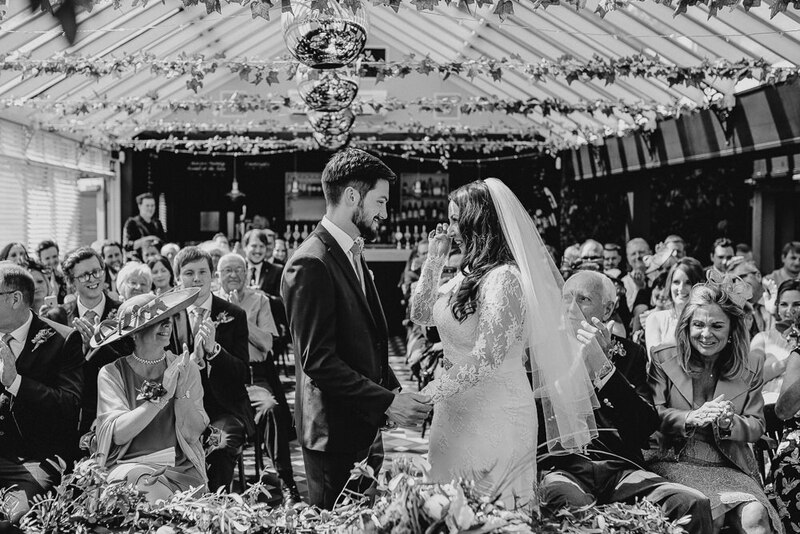 We also knew we wanted to have a relaxed atmosphere on the day, and an epic party at night! 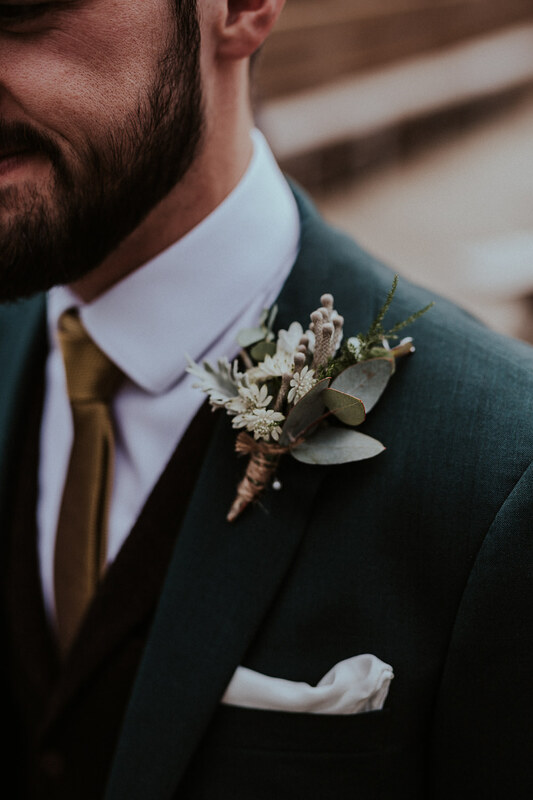 Luckily our tastes in décor are really similar, and we both wanted quite a simplistic, contemporary style for the day, with a simple green, white and gold colour scheme. 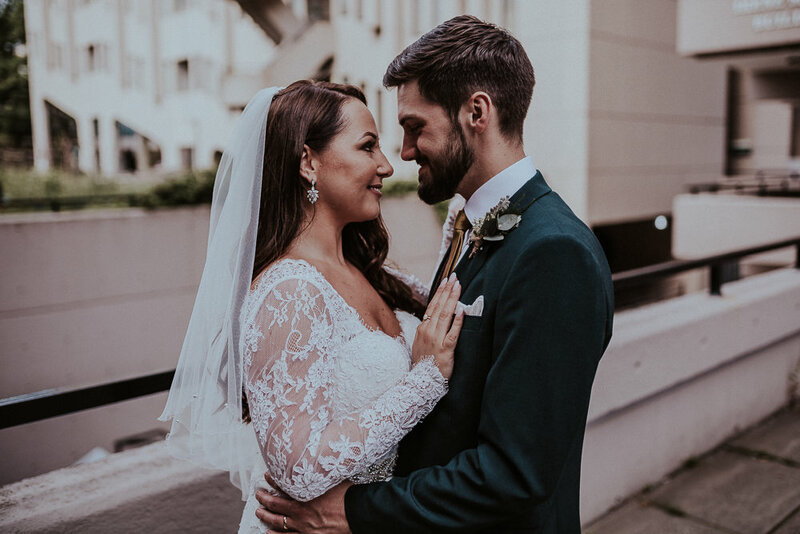 When it came to it, I realised that I didn’t care too much about the little details, I was just excited about celebrating our relationship with all our friends and family. 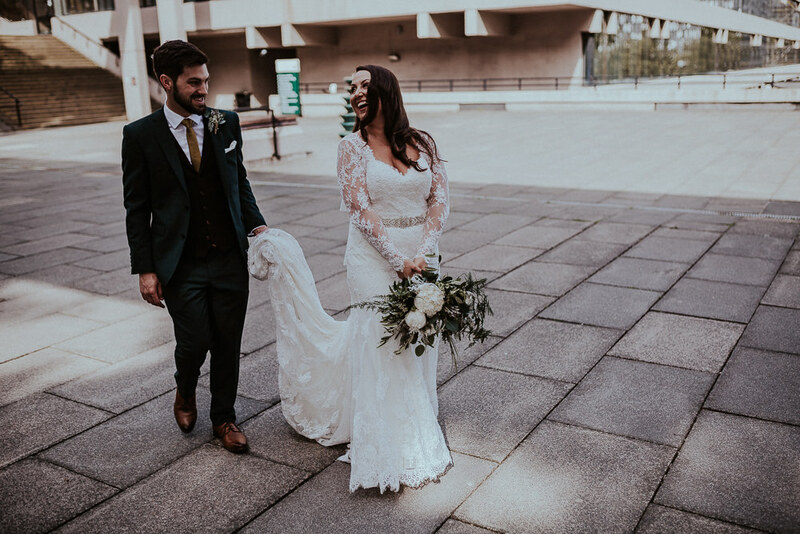 Within three months of our engagement, I had my dress bought, the venue picked, date set and the band booked. 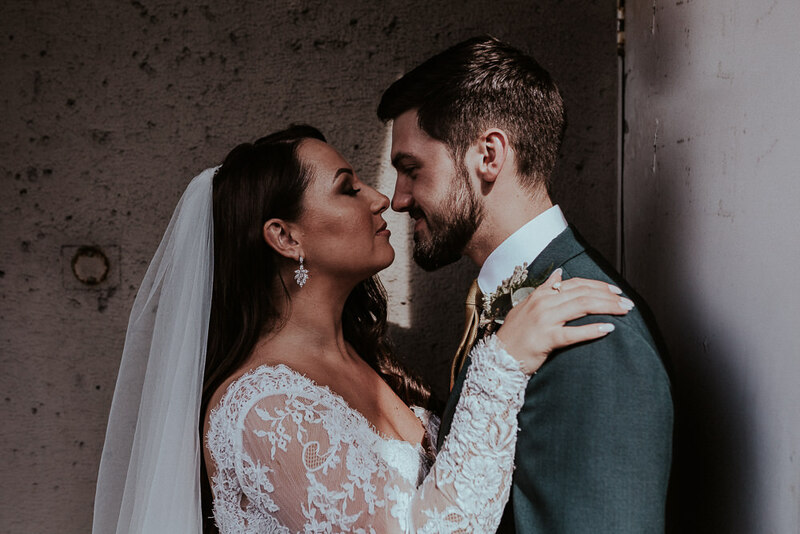 We knew that we were going to try and book as many things as we could through recommendations, previous great experiences (at other weddings) and/or friends who work in the various industries. 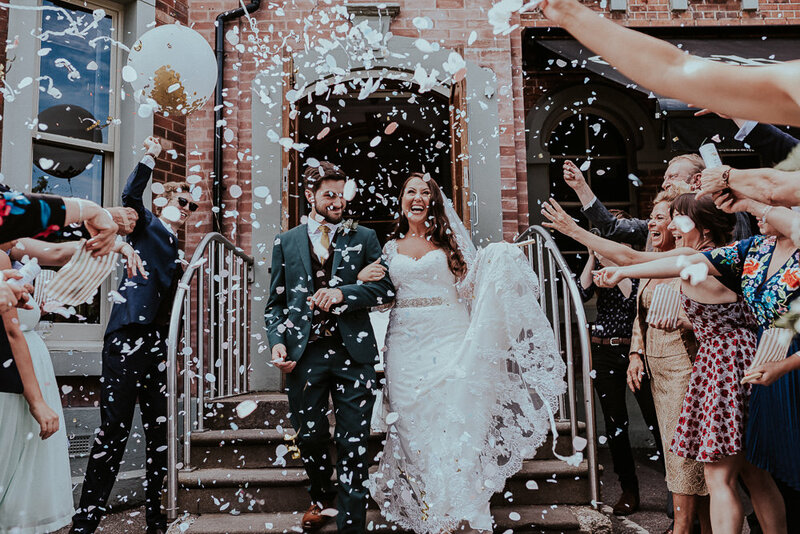 This really helped narrow down the huge amount of choice you’re faced with when starting to research wedding photographers, florists, cake makers, bands etc! 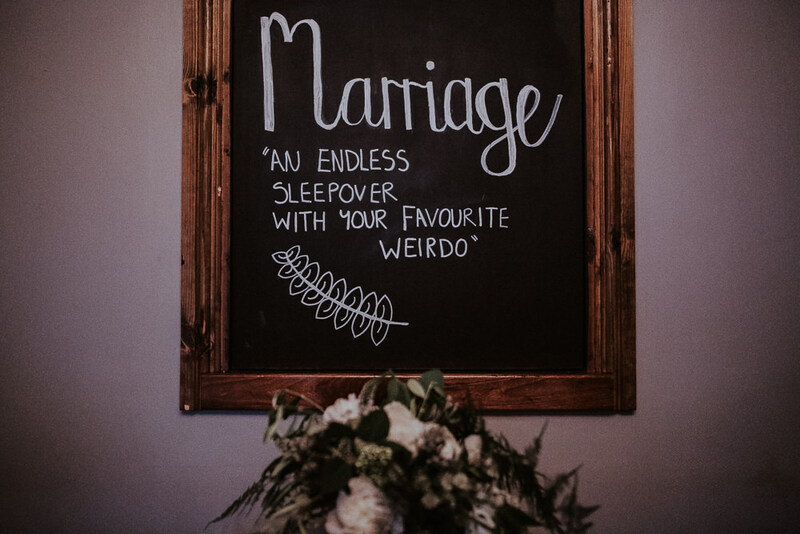 We didn’t attend any wedding shows or open days, but Pinterest was pretty invaluable for identifying themes, ideas, colour schemes etc. 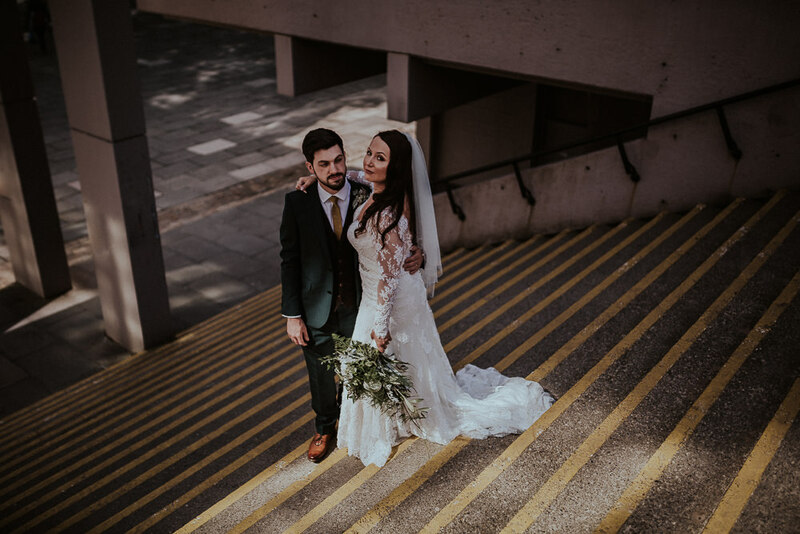 We were incredibly lucky, family offered to help us financially with our wedding day. 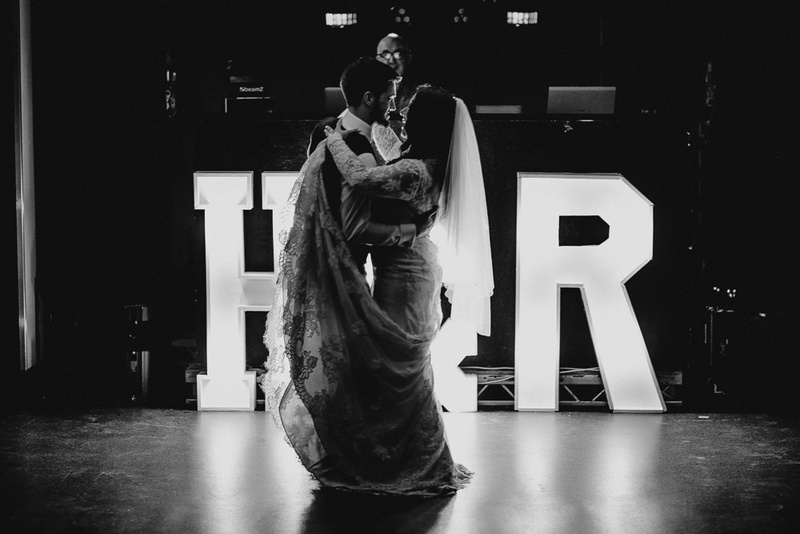 We felt very strongly that a wedding is essentially a big party, and we really didn’t want to spend a fortune. 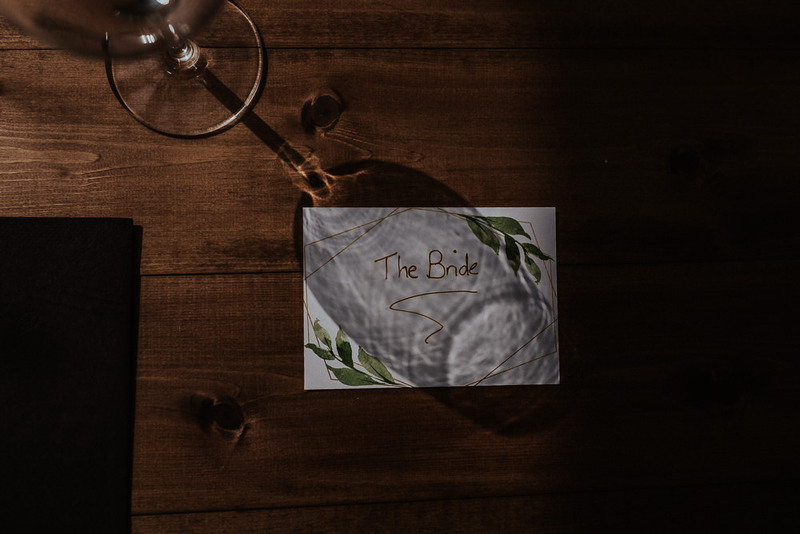 You realise quite early on however that when paying for anything wedding-related, it’s probably going to be more than you expect! We wanted to stick to a £10k budget all-in, but in the end we went over that a little. 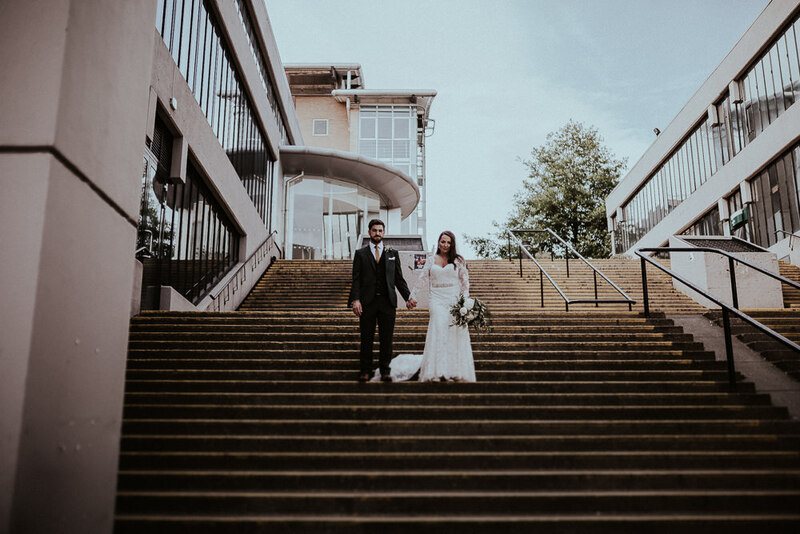 We quickly narrowed the location down from ‘somewhere in Yorkshire’ to ‘somewhere in Leeds’, as we decided there was no better place for us to get married – we met here, bought our first home together here and have spent the entire 9 years of our relationship in this great city. 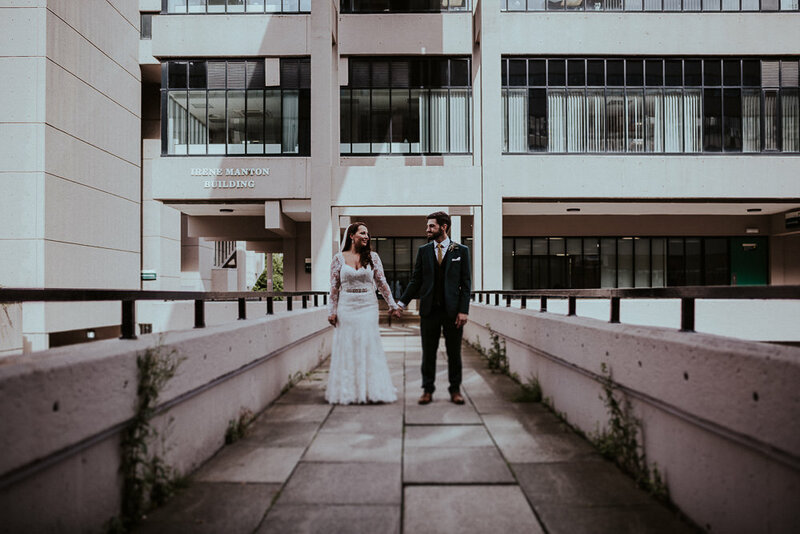 After visiting a lot of wedding venues, we were finding that they either didn’t feel quite right for us and/or they were way out of our budget. I finally convinced Rob to look at The Faversham as a potential venue… we had initially dismissed it, as we had both visited ‘The Fav’ often in our student years 10 years ago, when it was a nightclub and live music venue and had quite a few hazy memories of drunken nights there, so Rob didn’t think it would have the right ‘wedding vibe’ for us. Thankfully he was wrong – as soon as we got there we knew it was the place for us. A lot had changed in 10 years! 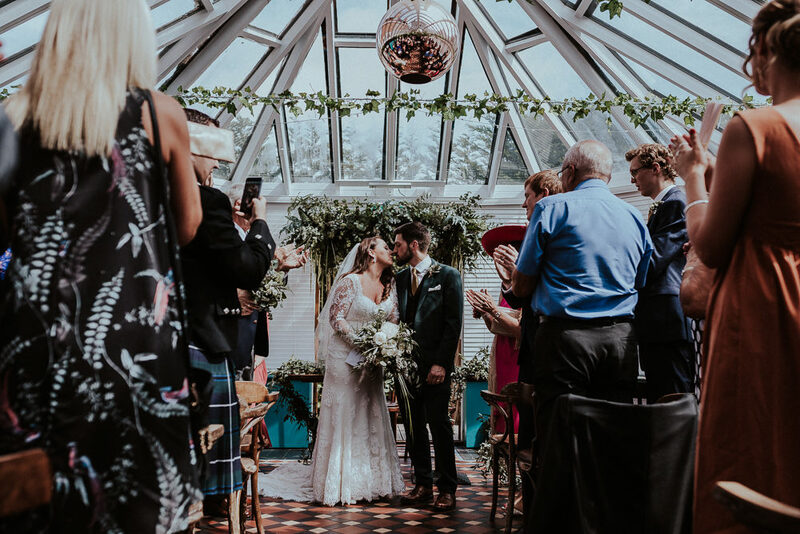 The fact we could get married and party all in one building without having to organise transport from one location to another was a big plus for us, And the quirky décor, bright conservatory space and relaxed vibe was exactly what we’d been looking for. 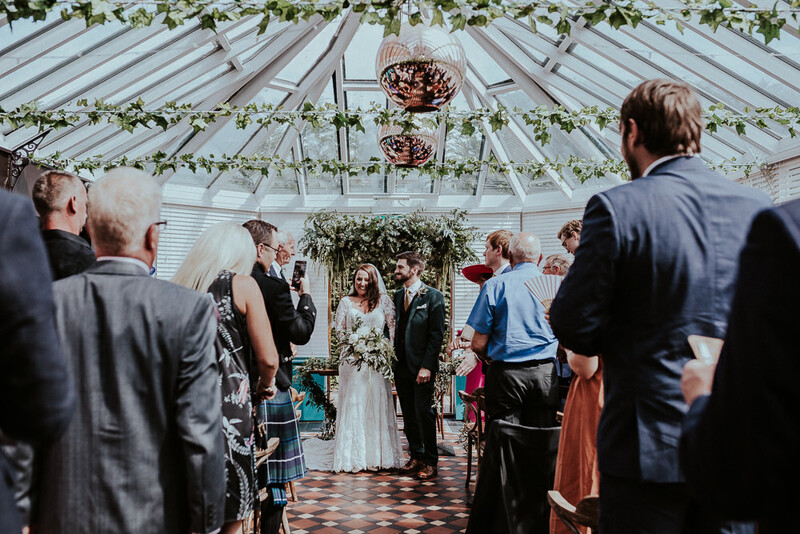 We had the ceremony and wedding breakfast in the beautiful conservatory, reception drinks on the deck and lawn, and the evening party and live music in the (re-furbished) old club room – it was perfect! 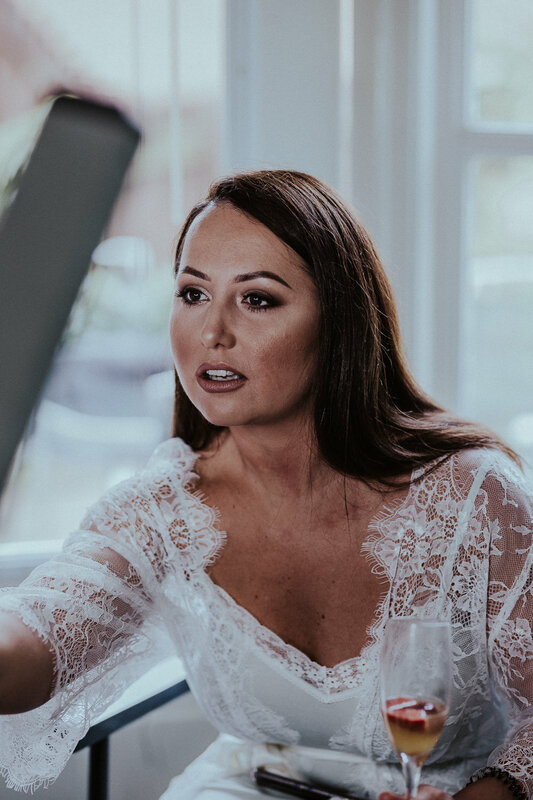 The event manager Gemma was fabulous and took so much of the stress out of the process for us, especially as it got closer to the day and I started to get more anxious! She knew exactly what we wanted and delivered beyond our expectations on the day. 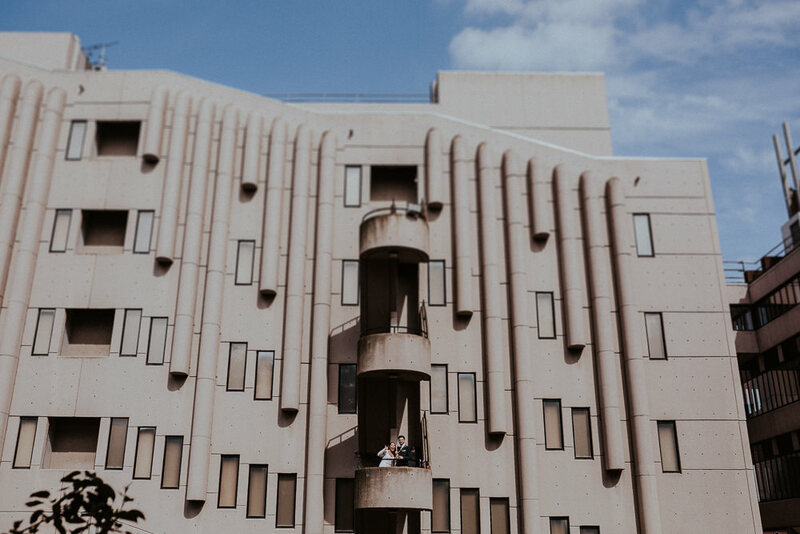 The Faversham is also right on the edge of the University campus, so we ended up going for a short walk and getting some great pictures around some of the cool architecture. That was an extra nice touch as we met during our time at the University of Leeds! 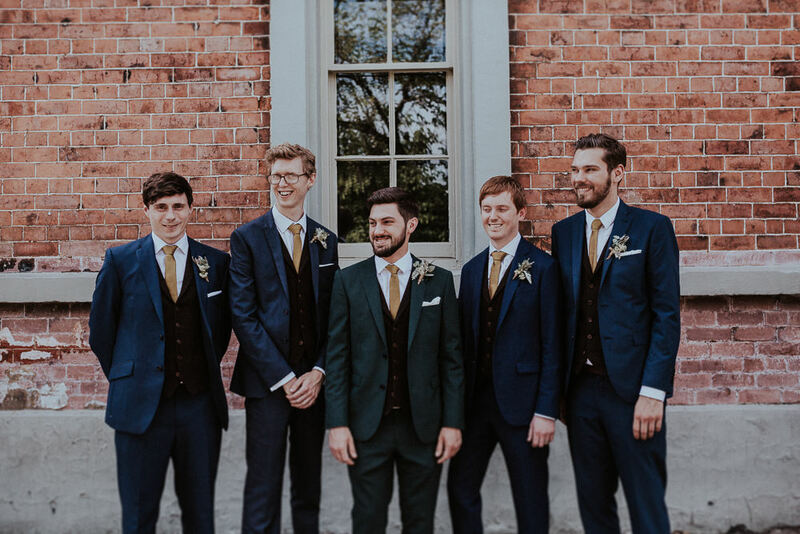 Rob wanted to look a bit different as the Groom, so went for a dark green suit, brown tweed-style waistcoat and gold coloured tie – all from Next! He clearly has a better eye for fashion than I realised, as when I saw it all put together he looked great. 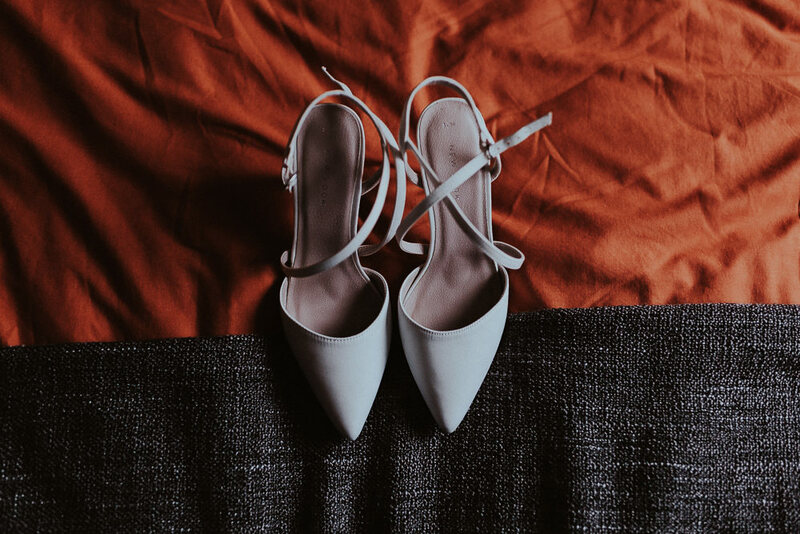 I didn’t have a firm idea in mind of what style of dress I wanted, and my main plan was to just go to a couple of dress shops and try a range of styles on, to see what felt best. 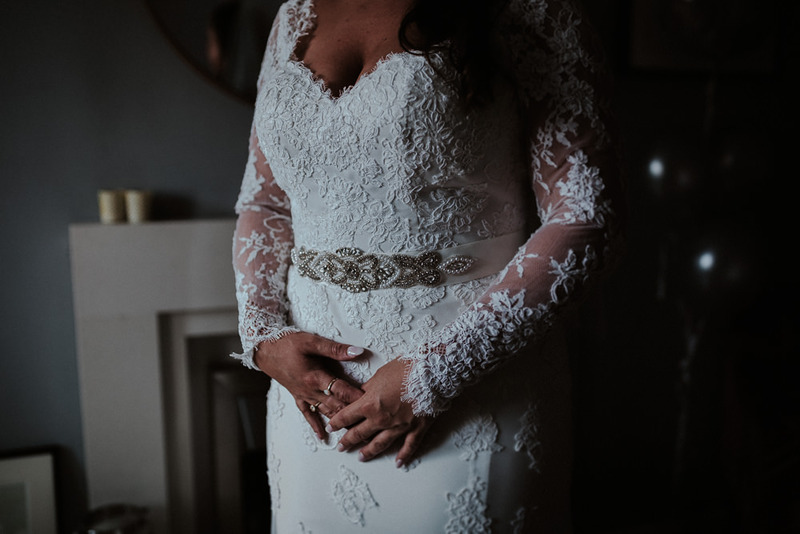 As I didn’t want to spend a fortune, I went to an ‘off the peg’ shop in Leeds, and picked an Essense of Australia dress; a French-inspired A-line gown with a vintage lace overlay. It was definitely more form-fitting than I thought I’d go for! I added a belt to try and accentuate my waist, and a veil for finishing touches. As I bought the dress ‘as-is’, I had to have quite a lot of alteration to it afterwards. 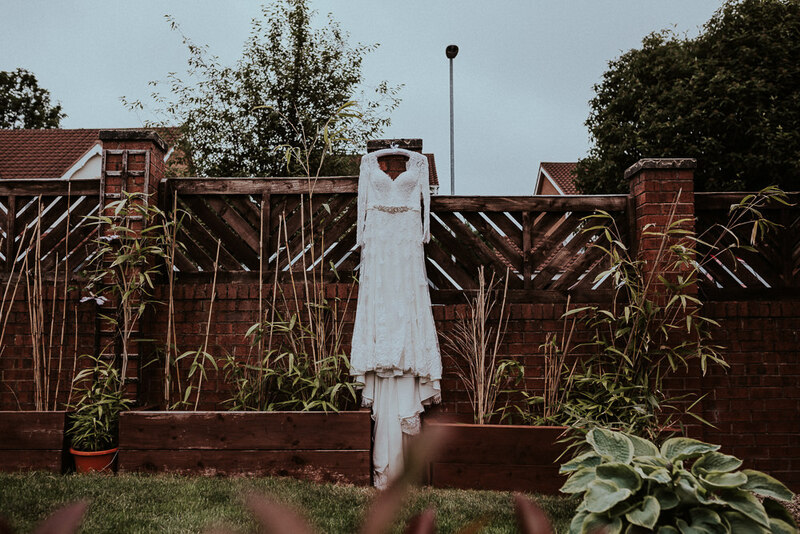 It was a scary prospect handing over my dress to be chopped up and put back together, but the wonderful and talented Steph, at Stephanie Kate Bridal Couture, put me at such ease through all my fittings and made the dress fit perfectly; it looked like it was made for me on the day. My shoes were from New Look. 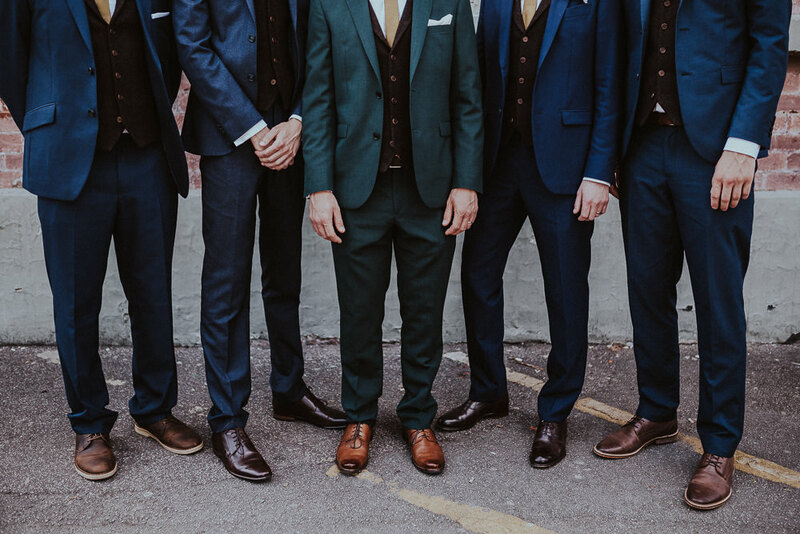 The boys wore their own suits – it just so happened that all four of their individual blue suits looked very similar! 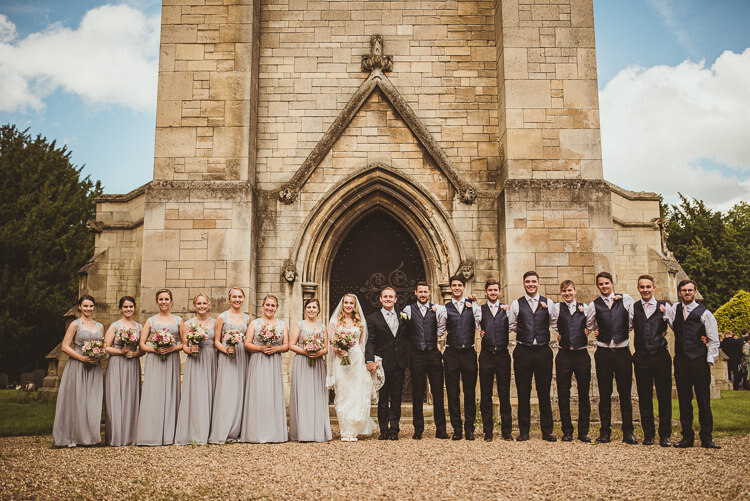 They also wore the same tweed-style waistcoat and tie to match Rob. 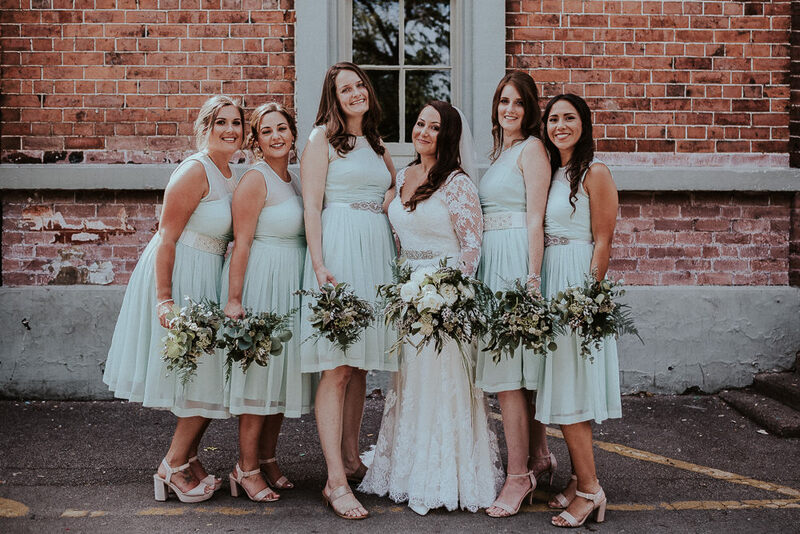 The girls wore matching light green chiffon dresses from Asos, knee length and floaty. 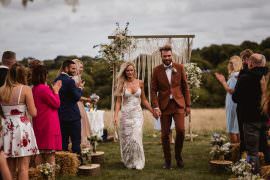 They were perfect for the relaxed vibe of our wedding, and the summer heatwave we were experiencing at the time! Live music in the evening: Hyde Park Brass – A local brass band who cover all sorts of great party songs. Who doesn’t love a cover of Chaka Khan!? They can be seen playing all over Leeds, have just released an album, and also have a beer with Northern Monk. 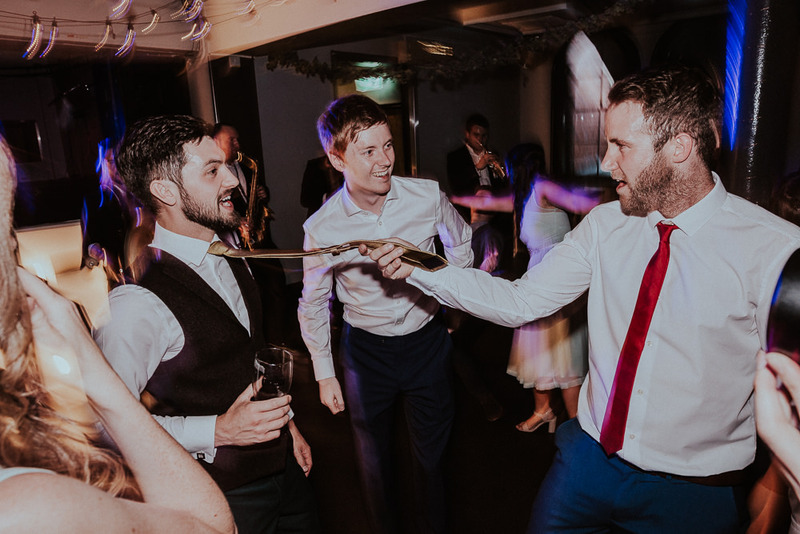 They are happy to try and learn songs for you, and absolutely smashed Killing in the Name Of by Rage Against the Machine for us (which is becoming a bit of a wedding staple in our group of friends)! 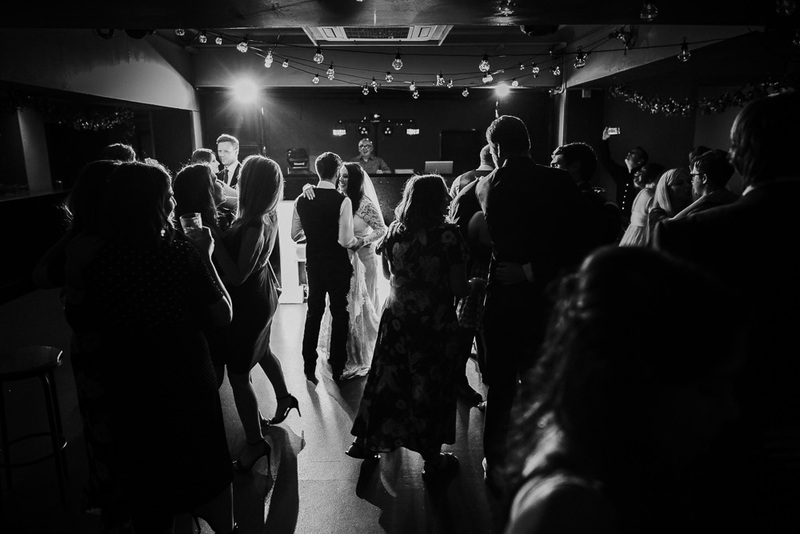 It was like having a private gig, our guests LOVED them, and they got everyone on the dance floor, and rather than get up on stage, get in and amongst the crowd to really get everyone involved. 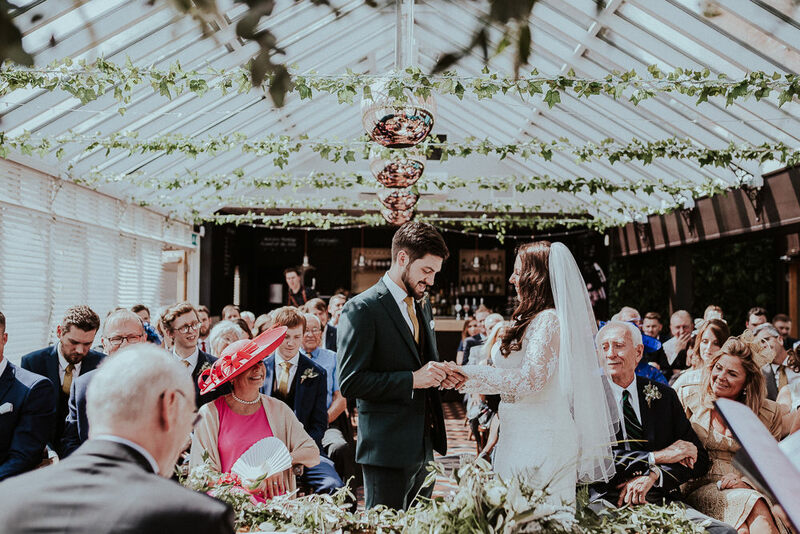 The Faversham already has lots of cool, quirky décor and detail throughout the building, with a stunning tiled floor in the bright, pretty conservatory, funky artwork, rustic-style wooden tables and chairs, huge gold-gilded mirrors, gold/copper furnishings and greenery throughout – this meant we really didn’t have to add much for the venue to already look great, and it fit our style perfectly. 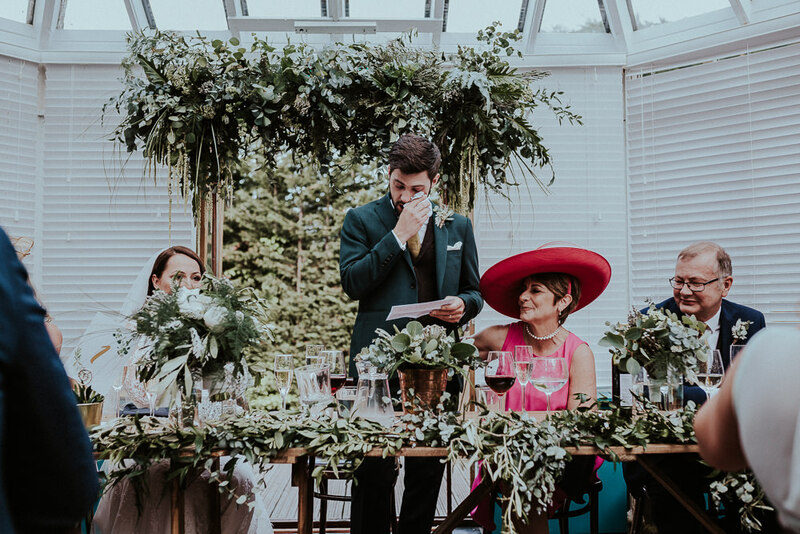 They even put up a gin bar on the deck for reception drinks (which was gin and tonics) and decorated it with eucalyptus to match our foliage choices. 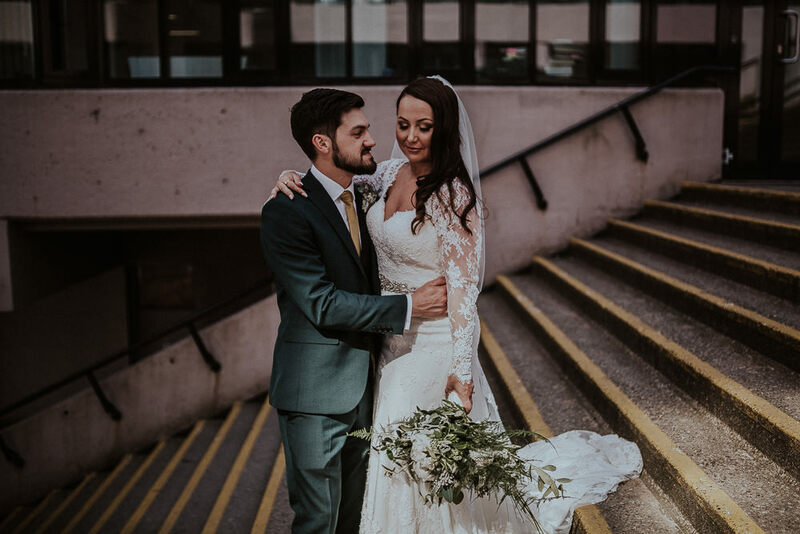 The rest was pretty easy… Pinterest was so useful for finding styles and ideas that fit our ‘theme’ of green, white and gold with a contemporary look. 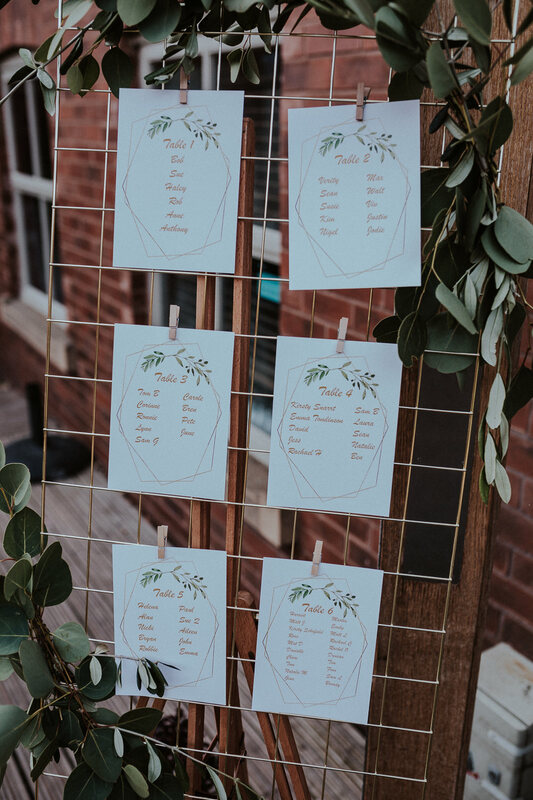 I made the name, seating and table number cards to match our invitation design (a greenery and gold, simplistic design – found on Etsy). We decided not to go with traditional favours, and instead donated to local Leeds homeless charity ‘Simon On The Streets’. 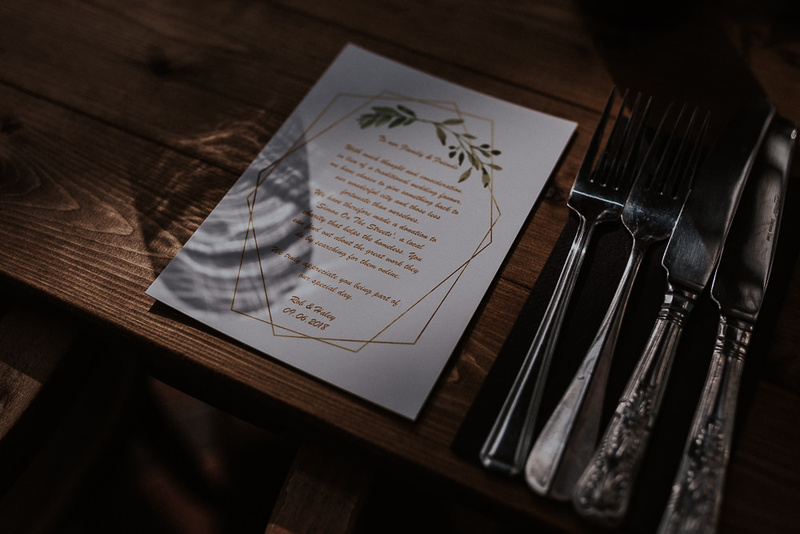 On a day filled with happiness, love, food and drink, we felt that we should give something to those less fortunate than us, and the charity offers amazing street-based support to homeless people across Leeds and surrounding areas. 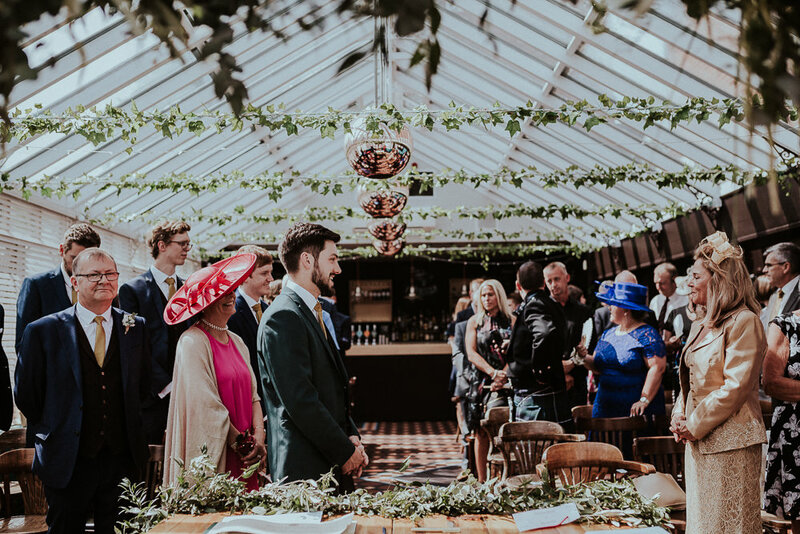 Some of the smaller touches we added included hand fans for guests to pick up on their way into the ceremony room; as it was in a conservatory and we were experiencing a heatwave, I knew they would be much appreciated! We used gold plant pots and succulents (from Ikea) with gold-wire holders that I made for the tablet numbers. All of this was left with the event planner Gemma a few days before and she pulled everything together perfectly on the day for us. 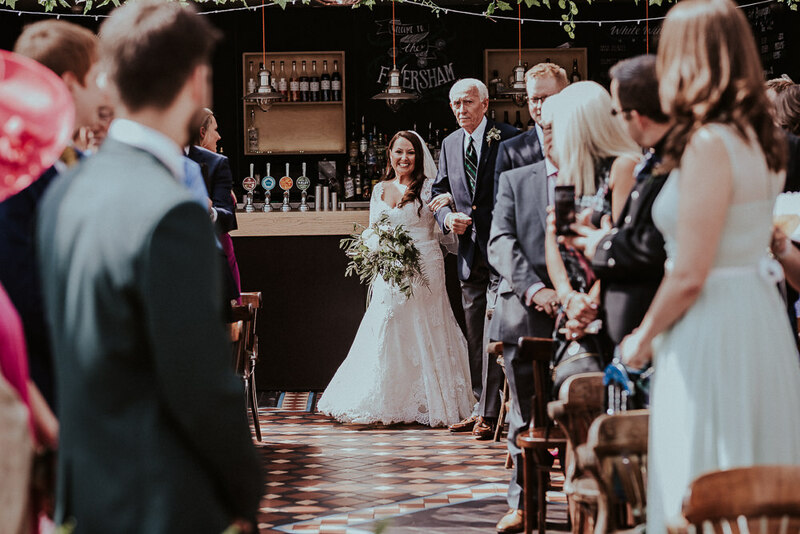 We knew before we even got engaged that when our wedding day came we’d want to ask Catherine at Petalis Sheffield to be our florist. 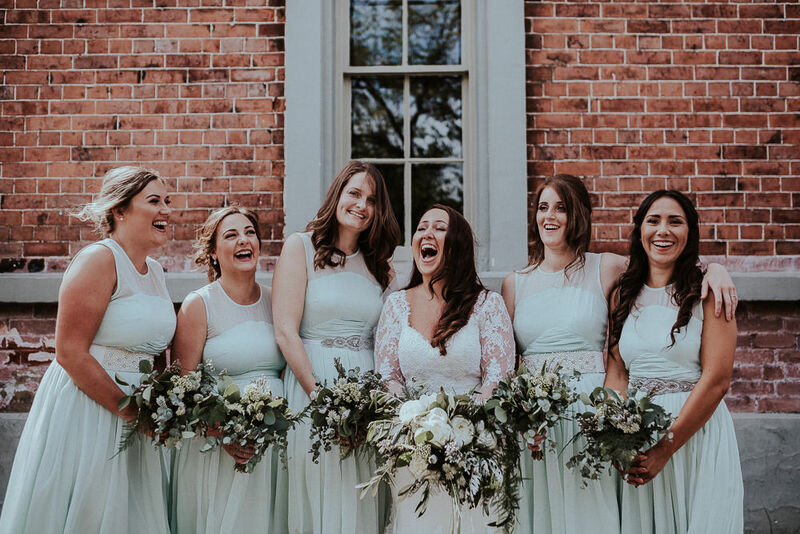 We’d known her for years through mutual friends, and seen her amazing work at a friend’s wedding, so there was no doubt we knew she would make our wedding day beautiful! 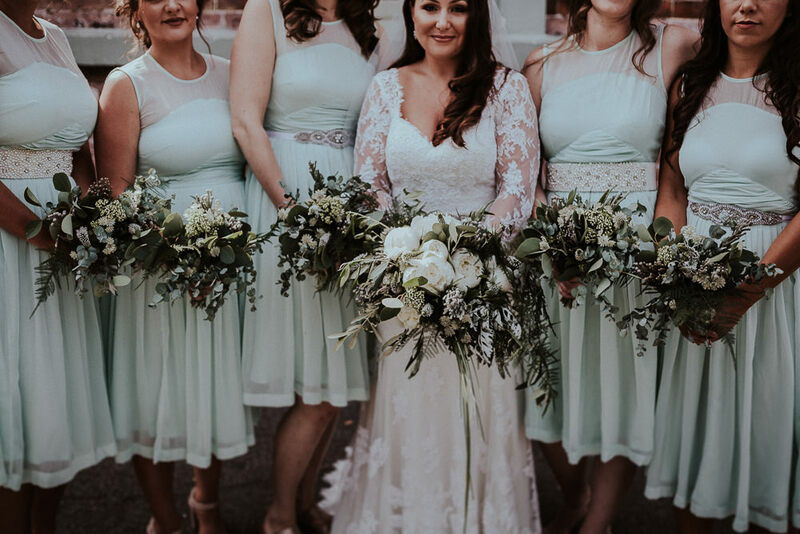 All we told her we wanted was a green and white colour scheme and less flower – more foliage, and with that little information she designed our dream wedding florals! 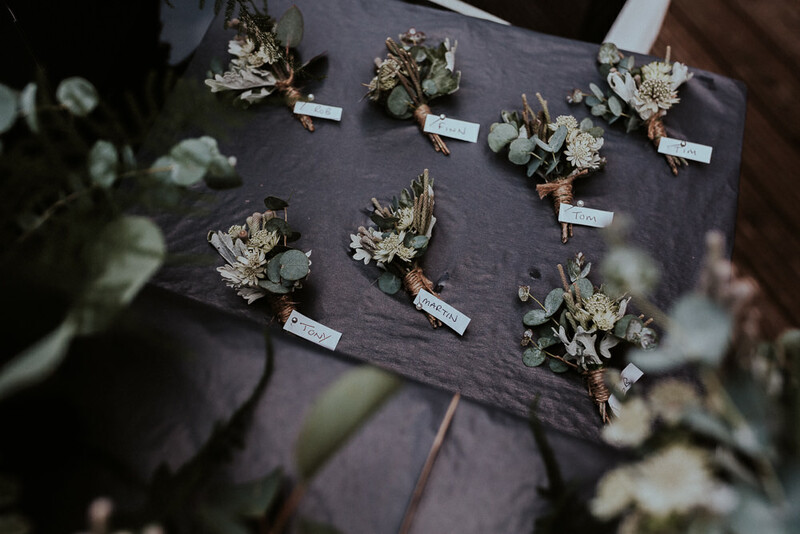 I carried an asymmetric bouquet with pops of white flowers; Ivory Peony, Astrania, Brunia, Lace cap Hydrangea all nestled in a mix of foliages. 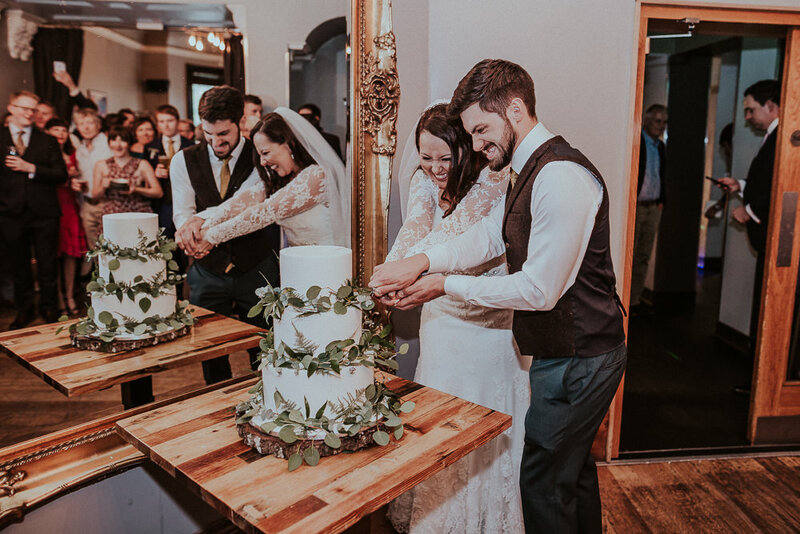 The Bridesmaid’s bouquets and Groomsmen’s buttonholes complimented my bouquet, and for the ceremony and wedding breakfast we had a canopy arch and table garlands. So many to choose from! My Grandpa came all the way over from the USA to walk me down the aisle, so that was a pretty incredible moment and very emotional. Getting to the end of the aisle, seeing Rob’s face and holding his hand. 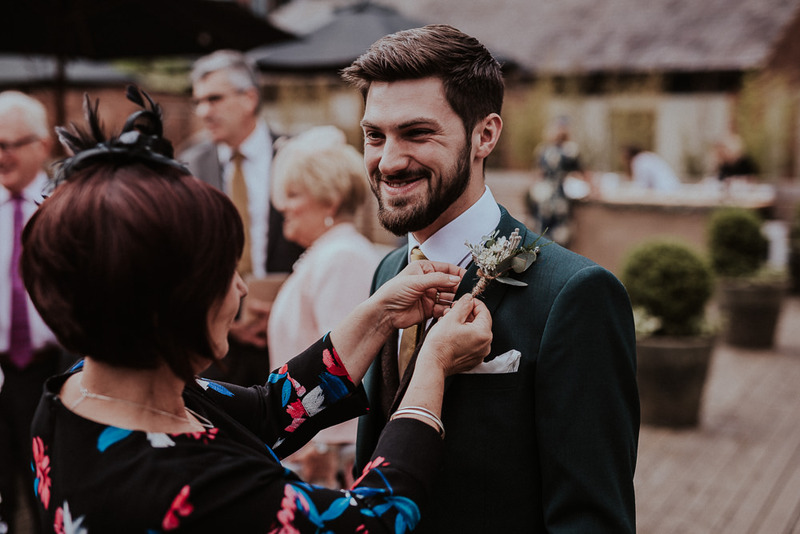 All the speeches were amazing; my mum brought the house down with hers, and Rob getting emotional when it was time for him to speak was a tear-jerker for the whole room! 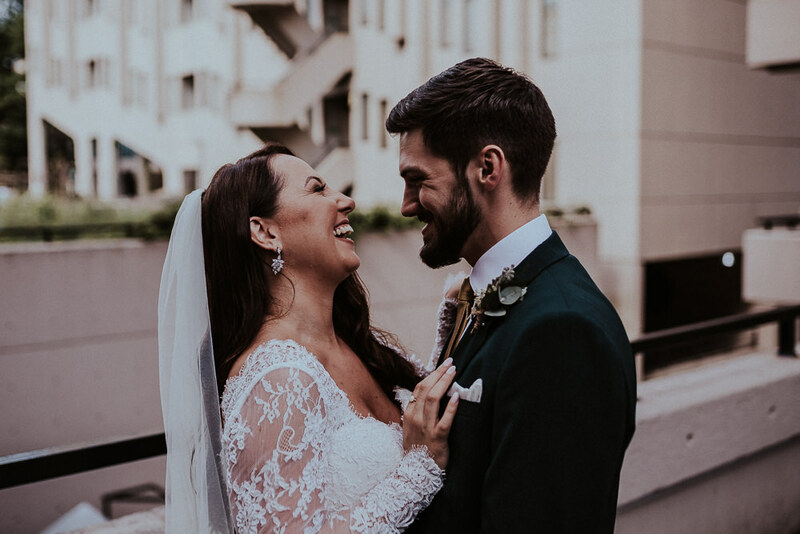 Some of the advice we’d had from previously married couples, was to just make sure we took time out during the day to stop and soak in the moments together, and we made sure we did that. 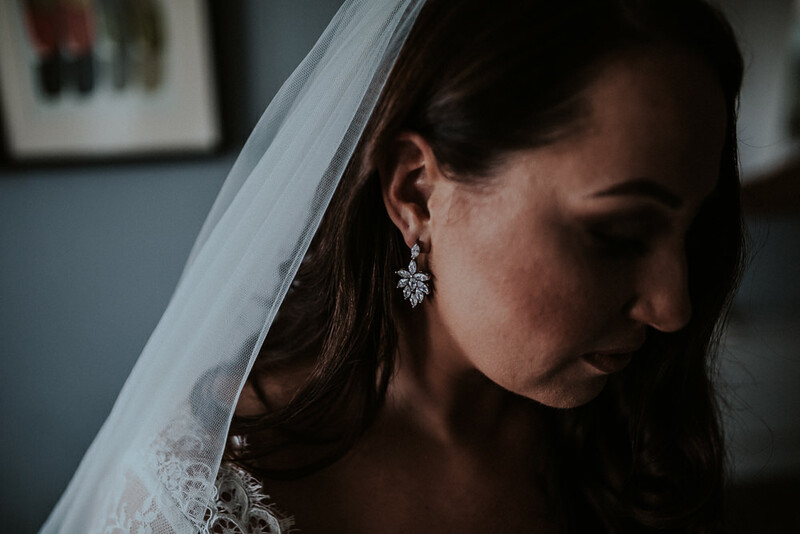 There was a moment after the whirlwind of the ceremony and speaking to our guests when we just walked through to a quiet room, took a breath, and just wowed at the moment together. 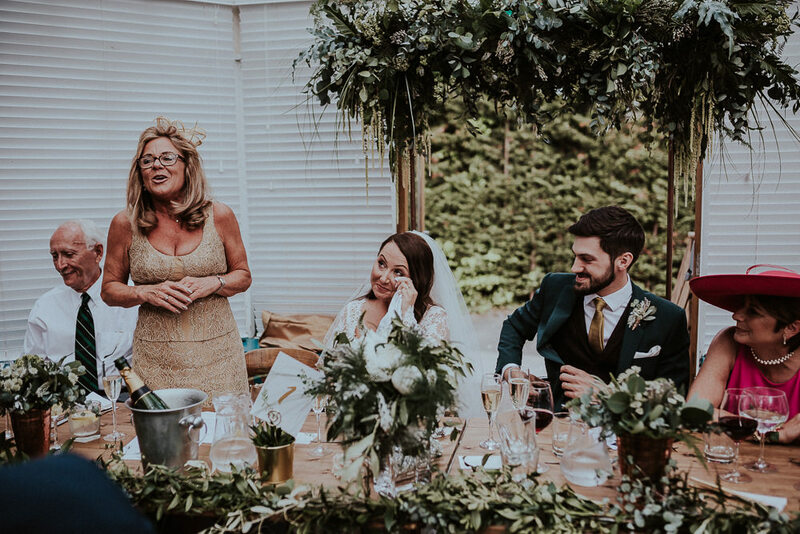 Stopping for a few minutes during the wedding breakfast to just look around the room and take in all our friends and family laughing, chatting and having a great time was really special too. Seeing how much all our guests loved Hyde Park Brass (the live band) was awesome, as we excited about them for months. Having the biggest grin on my face ALL day. Steven Haddock – Steve is Rob’s friend from college, who just happens to be a photography genius and whose style was very ‘us’. It helped that he is such a lovely guy too! 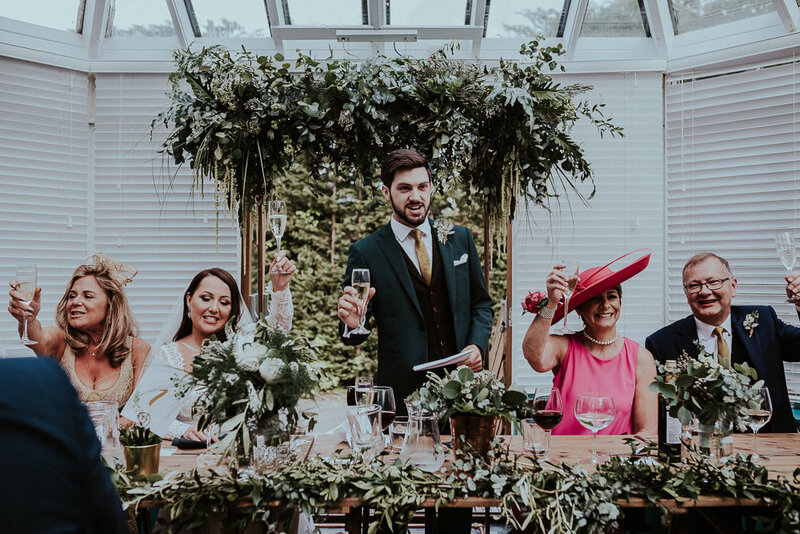 He kept everything nice and relaxed on the day and got on really well with the guests. 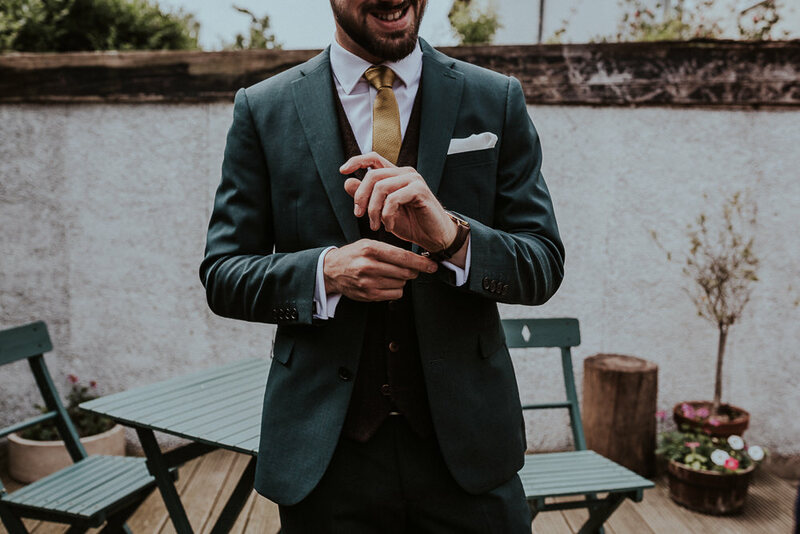 Steve mostly takes photos of bands on tour and of festivals, so when he does turn his hands to weddings it definitely brings something unique. He has a great eye for what will make a really interesting shot, as you can see. 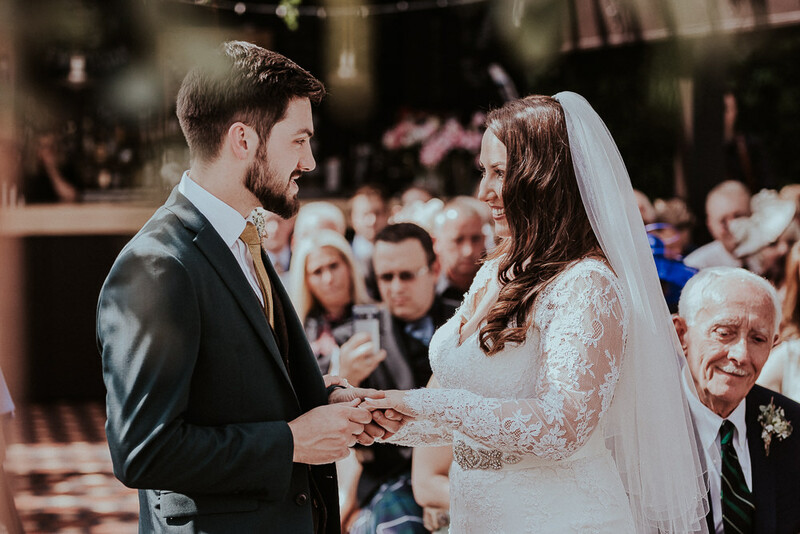 The photographs are definitely one of the most important investments of your wedding, and we couldn’t have chosen a better photographer to capture the magic of our day. Also credit to Pete who helped out for the first half of the day. We went to Spain for a week the day after the wedding, but we didn’t count that as an official honeymoon as we went with some of my family! We went to Las Vegas a couple of months after (to attend a friend’s wedding actually! ), but we had a few days just the two of us there, and it was amazing. Don’t sweat the small stuff! 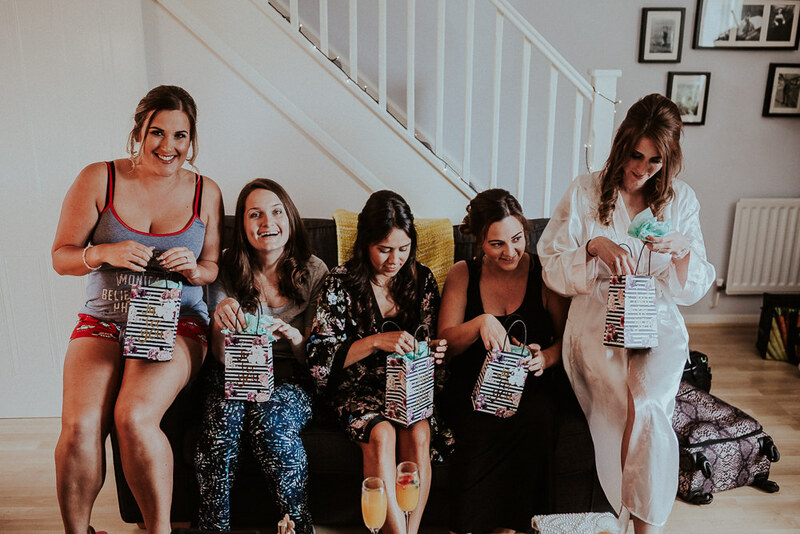 The décor and details are lovely, but it won’t be the way you’ve displayed your seating chart or the handmade pom-poms that you and your guests will remember, so if you feel it’s all getting a bit too much like hard work, don’t worry about it. The day can feel like such an overwhelming whirlwind – take time to stop and soak in the moments, and spend time TOGETHER! 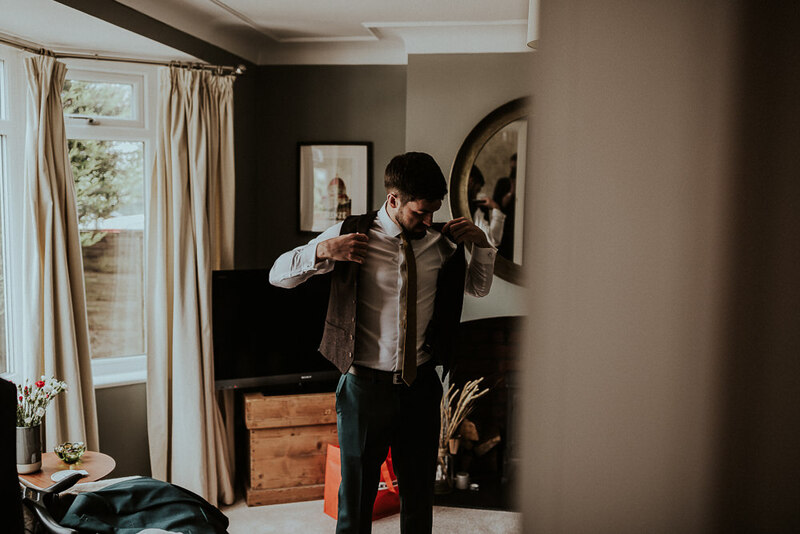 You can feel like you need to work the room all day/evening, but your guests don’t expect that of you, and want you to enjoy YOUR day as a newly married couple. Invest in a good photographer. 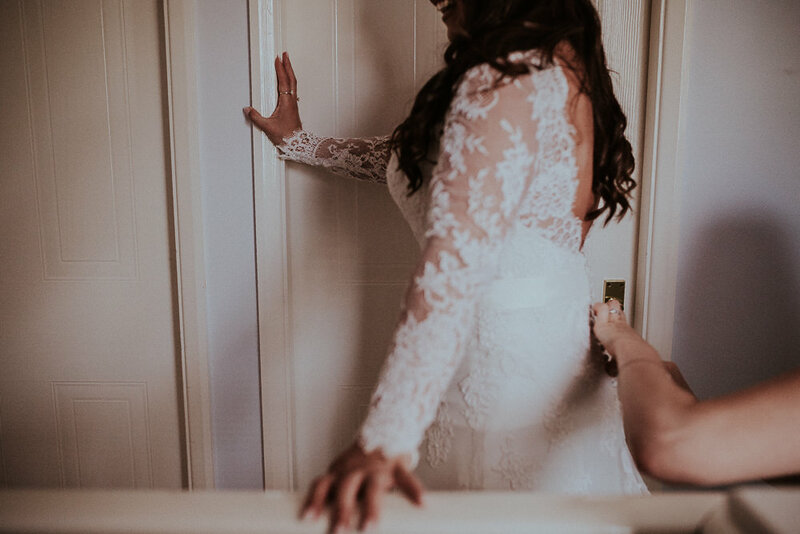 I knew it was important, but I didn’t appreciate just how much our photos would mean to me; our photographer captured so many amazing moments – of us together, of our friends and family, and also of the bits that we completely missed because we were elsewhere and had no idea they were happening –looking through them all brings back the most special feelings every time. They really will be something you think about your grandchildren looking at! Her DRESS! 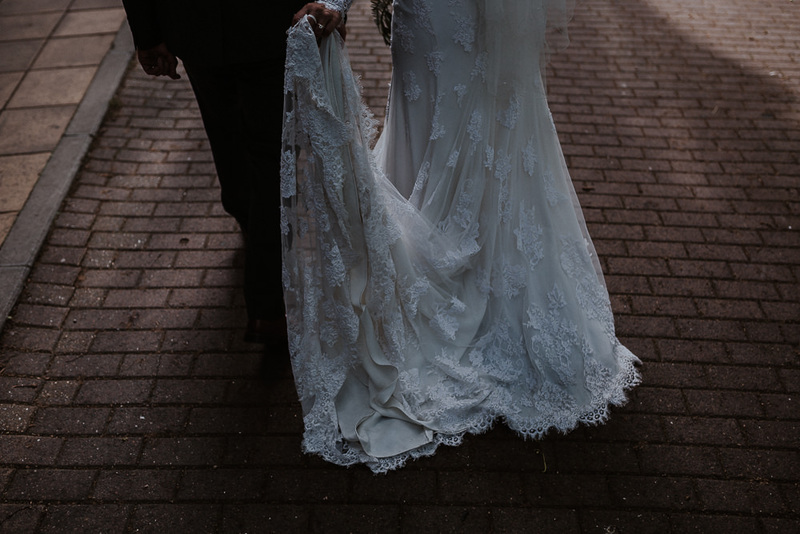 That full head to toe lace dress is nothing short of magnificent.